Google has just taken another giant step to launch an improved job search service that provides structured search results when users in Nigeria search for job related. This is simply to make the job-searching process a lot easier for all job-seekers in Nigeria. This service will focus on all types of jobs ranging from all experience levels, job fields, various industry positions and even high-end professional jobs. It will also leverage Google technologies like machine learning and Artificial Intelligence to better understand how jobs are classified and related, among other things. What this simply means in reality is that, searching for jobs in Nigeria has just become a lot easier and a drastic improvement to how it was done before. Today, March 1st 2018, Google has begun to recognize when Nigerian job-seekers are typing job search queries into Google Search, and will then highlight jobs that match the query. You can simply just type a job title on google.com were all the jobs posted by various job portals and company career websites relating to your keyword pops up in an organized manner like the picture below. 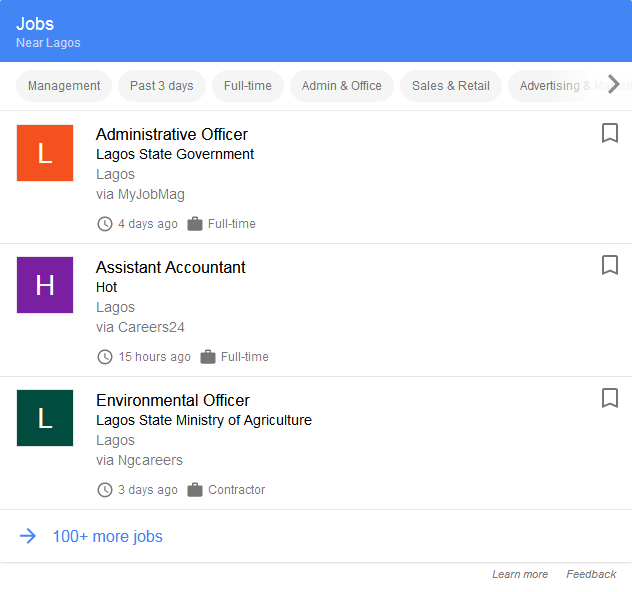 You can also search based on just using “jobs in Nigeria”, where you can filter the jobs based on the states, cities, job fields and even job types. However, Google is not necessarily taking on the services of traditional job portals in Nigeria with this launch. Instead, it’s partnering with Job Portals such as ours and others to ensure that the Job contents are always available on their search engine as Google itself does not post jobs. To this end, we are proud to be a partner to achieving this same feat. Taking a step further, earlier on today during the launching, MyJobMag was invited to take part in sharing ideas and insights on how this can work effectively in the Nigerian System. With the presence of the Special Assistant to the President on Job Creation and Youth Empowerment, and various media houses, MyJobMag and other Partners took the opportunity to address the issues of un-employability among Job-seekers in the country. They did this by analyzing the problems in the job industry, first from the problems associated with the job-seekers and of course as associated with the Federal Government.